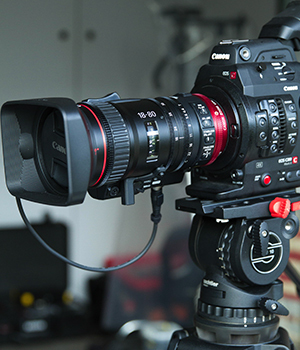 The Canon Cine range of lenses have been around for quite a few years now. The CN-E Cinema Prime lenses became an early alternative to using PL adaptors or the Zeiss Compact Prime lenses. Other than that the choice was rehoused stills lenses or maybe if you were lucky a set of Zeiss super speeds. The cine lens set became a cost effective offering for sharp prime lenses with clear and accurate markings for proper functionality. Although cost effective for their quality and feature set they are still prime lenses and both unnecessary and out of reach for many self-shooters and owner operators. Perhaps because of the often evangelising nature of those shooting with the hallowed 5Dmkii and Canon stills primes and L series zooms, it has taken a long time for Canon and other manufactures to bring useful, high quality and affordable zoom lenses to market. Those creating content with L series lenses on cameras such as the C300 and C300mkii, as well as with the Sony FS7 proclaim the bokeh and cinematic qualities seemingly inherent with the stills lenses. They are fast, sharp, have excellent contrast and create that super shallow depth of field that everyone seems to want. So in 2016 when Canon announced the CN-E 18-80mm T4.4 lens it was met with much anticipation. Finally, Canon with all their lens making history and expertise (I'm transported back to the first camera I really made films with the Canon XL1) were to manufacture a cine style zoom lens that would be within reach of the self-shooter and owner operator. At the higher end of Canon's cinema zoom offering is their really rather lovely CN-7 X7 17-120mm T2.95 cinema zoom lens - designed for the Super 35mm sensor, a lens that has found a clear following amongst broadcast professionals, in natural history, ENG, drama - you name it. It is a lens that I've hired on a number of occasions where I required a fairly fast PL mount zoom lens. The CN-7's major strong suite is its price vis a vis the main competitors from Fujinon especially. However, it represents a hefty investment for any owner operator yet it also has the ability to outlive the investment made in the camera, has a better residual resale value and has the advantage of coming in either PL or EF mount options. Having spent a fair amount of time with the CN-7 on a number of jobs I welcomed the opportunity to try out the CN-E 18-80mm and see what it offered for the price point. Canon are fantastic lens manufacturers there's no doubt about it, the CN-E draws upon their rich knowledge of lens production. It attempts to fill a space for the professional shooter who doesn't want to hire glass, who wants a go to lens that can live on the camera. One that fills a useful range, is parfocal, low cost and comes with the same full feature set as lenses that conventionally cost seven to ten times the price. I would point out that this list of requirements is nigh on impossible! Ask any cinematographer, a zoom lens will always be a compromise over a prime. Ordinarily, I like to test out a lens or review kit based on an actual real world work but unfortunately this simply wasn't possible with this review given I've just become a first time Dad and the jobs I had on were being covered by other shooters. So I took the lens and supplied C300mkii out to Audley End House in Essex to simply have a play handheld run and gun and get a feel for it. It was ideal testing ground, a beautiful spring day with lots of light and plenty of colour to shoot. Most of the shots sampled were taken at T4.4 with the C300mkii internal ND on. Canon Log-2 with a 709LUT baked in. The lens has the look of an L series lenses - but what about the feel? The build quality seems pretty decent and the weight whilst fairly light in the hands is still reassuring, but to be honest it doesn't feel as well made as the stills lenses. The major limiting factor out of the box for me is the aperture which at T4.4 is a little slower than you're used to if you've previously been shooting with L Series stills glass. That said, the range of 18-80mm is very useable for typical run and gun type shooting and the inclusion of gear teeth for the lens, focus and aperture mean that it would be useful if you were shooting on Steadicam or required motorised or manual follow focus. However, it strikes me that at the price point and quality it will be used by single operators and for those who've invested in the C300mkii will likely be a solid investment. The range whilst useful will limit you to B-roll and interviews, if you're filming a conference and require a close up from twenty-five metres away then you're going to require a second lens (the newly released but at the time of this review, unseen by the author, Canon CN-E 70-200mm T4.4 L IS) would clearly fit the bill. I should also acknowledge that the CN-E being 'cine' has the aperture marked as a T-stop or transmission stop like cinema primes and zooms. This is a measured amount of light that the lens transmits, rather than the mathematical calculation that an F-stop marking represents so can't be directly compared to the F-stop. T4.4 would be around f4 equivalent in the L series lenses. The focus throw when operating handheld is fine - it feels like a cross between the L series stills lenses and the more expensive cine zooms, but for the price point it is going to be a compromise. The focus ring has no hard stops but rather softer stops from near to far - which is an odd point given the 'cine' tag the lens has. One would expect hard stops on a cinema style lens. Focus breathing (unwanted zoom-effect) whilst focusing is kept to a minimum and whilst present on both ends of the zoom range is significantly reduced compared to stills lenses and is negligible in the middle of the zoom range. Back focus can be adjusted via two screws hidden on the top of the lens under a rubber flap, which when correctly adjusted will mean the lens is parfocal. The lens features various levels of image stabilisation and auto focus - which works well with the C300mkii, if you like that sort of thing! It might be useful for fast moving objects - the dual pixel AF will work best with the C300mkii I imagine. I used IS mode B and manual focus for my handheld tests which worked well. A highlight of the lens is the zoom rocker, hand grip and control. The ZSG-C10 Zoom Grip is well made and fantastically ergonomically designed and a real pleasure to operate. However, there are two downsides to this feature: Firstly, it is not included in the list price of the lens and so the total cost of the reviewed unit must also include the grip. Secondly, the servo cable sticks out too far on the bottom of the lens so without some kind of camera baseplate on the C300mkii you can't put the camera down without first disconnecting the cable - it's not ideal and needs to be rethought in my opinion. If you were filming with a tripod this wouldn't be much of an issue as you'd simply dock the camera back on the tripod. Whilst on the subject of the zoom, the motors are very quiet and responsive enough. Overall I liked the lens - it's not a prime or the CN-7, but then it's not going to be. On the FS7 it was nicely balanced having V mount power and a proper base plate - but you'll need the correct adapter. I have the Metabones Speedbooster Ultra, which is designed for a full frame lens so caused it to vignette with the 18-80mm. Metabones have recently updated their firmware to accommodate the 18-80mm so it's going to be worth considering for many FS7 owner operators as well as Canon C200 and 300mkii shooters. Canon cine zoom lenses have some stiff competition for FS7 users with the newly released Fujinons (though these are E mount only) and I think Canon must and will continue to enhance their mid range offering still further over the coming years, we are going to see more from other manufacturers in the next twelve months for sure. It would be nice to see Canon offer interchangeable mounts in the sub GBP 5K price bracket but I can't help but feel they would sell more units if they could create a zoom that was somewhere between the CN-E 18-80mm and the CN-7. The CN-7 at around GBP 23K is a lot of money - it's expensive to hire as well. But I've not seen the CN-E available to hire - it's also expensive at nearly GBP 5K including VAT for the configuration tested, add to that the newly announced CN-E 70-200mm and you'll still be spending over GBP 10K on your two basic lenses. So as a final thought - I like the lens but I think Canon have only scratched the surface in this new emerging area. Maybe it's a pipe dream but if they can create a 17-120mm lens at T2.6 for sub GBP 10K that could be used with EF, E mount or PL then I think they would really be onto a winner and I'd be saying please just take my money!